I have a problem with spring. It doesn't fit my home's decor. Spring colors are usually pastel and primarily pink. My home's palette is bright reds, deep blues and earthy greens. Pink doesn't work. It's taken me a while to build up my white-and-green collection, but this year, I finally feel like I have enough items to play with. 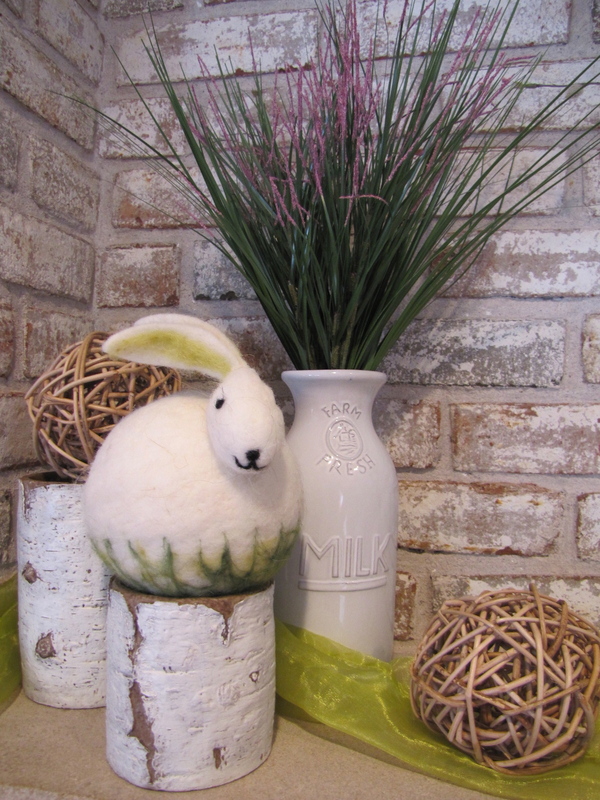 And the timing is perfect, because this is the first spring in our new house in which I have the energy to decorate. 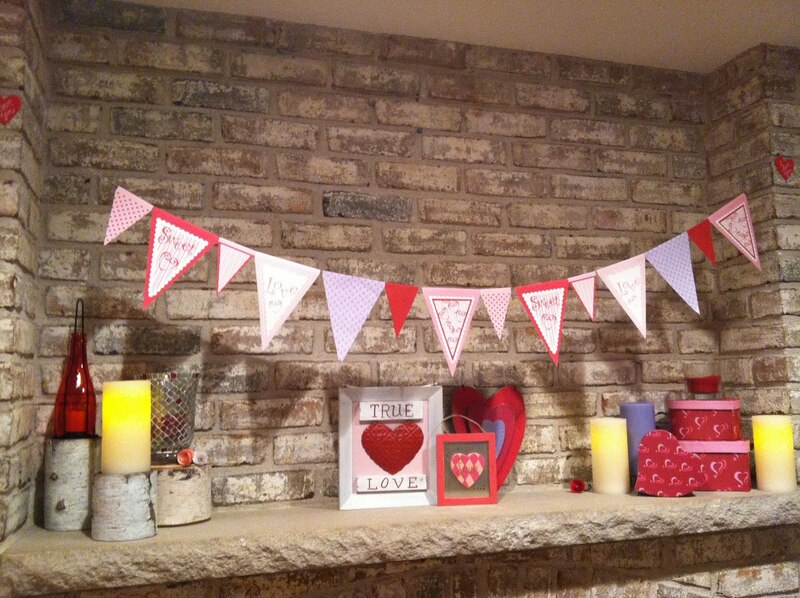 I loved my Valentine's fireplace, but it's been up since mid-January. It was past time for a change. Megan's post on spring mantles inspired me, especially since she has a lot of red in her home too. Here's what I came up with. This fireplace is in our kitchen sitting area, which is next to a playroom, so I like it to be whimsical and cheery, not too sophisticated. That said, my own style and this house scream out for texture and touches of nature. 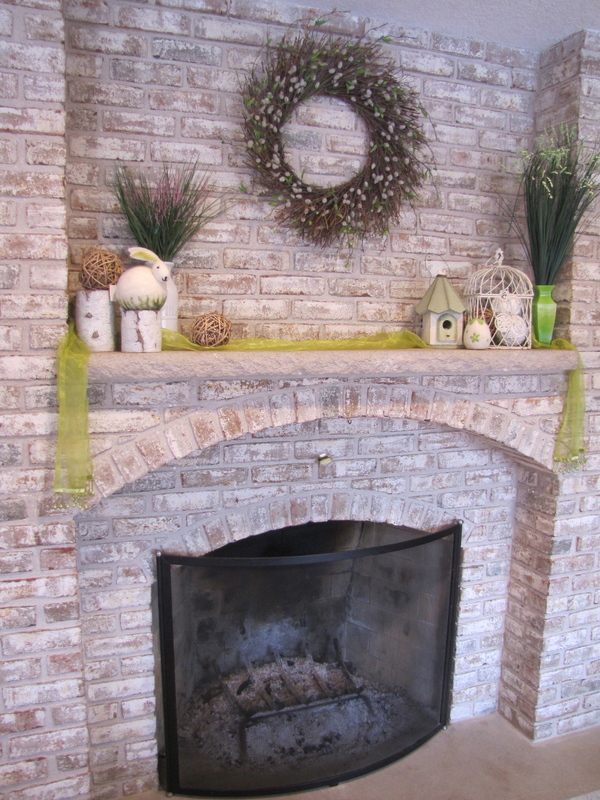 All of my mantles include something of the outdoors - birch bark pillars, rocks from Lake Superior, bumpy twig balls. I found the fuzzy felt bunny at a local grocery store this week and fell in love. It's the perfect blend of spring and make-me-smile. Plus, it's green-and-white. The only other place I decorate seasonally is the front entry table. Here's what I've got right now. I need something else on the right-hand side. Because this is next to the living room, which is decidedly more adult in feel, I'm comfortable making this more sophisticated than the fireplace. (Read: I tried to put a felt chick in here, and it didn't work.) Any ideas? Maybe a stone bunny? Connor, Natalie and I watched the eggs hatch, we watched the scrawny baby birds change into feathered nestlings. We watched them learn to fly and then we watched them leave. When fall came, and no other birds seemed to care about the nest, I asked Corey to take it down so I could keep it. 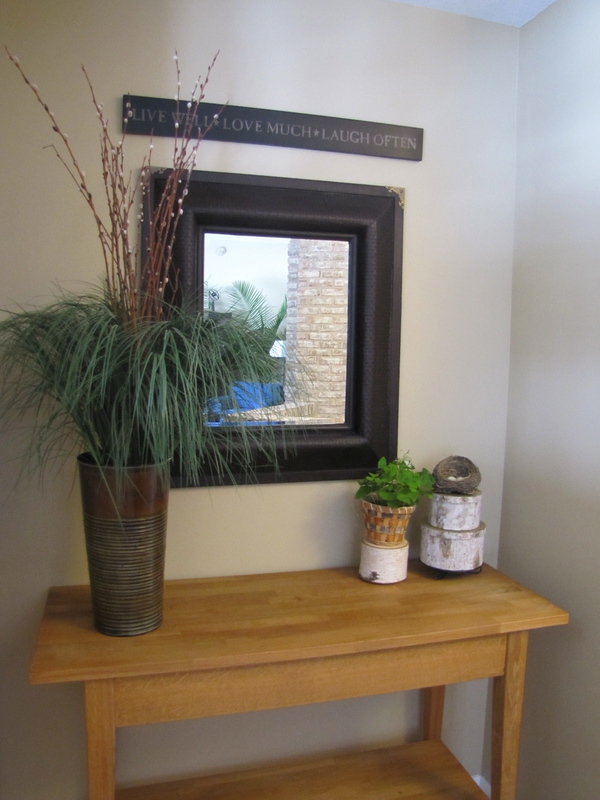 And now it sits in our entry, filled with a trio of fake blue robin's eggs, a reminder of the sweetness and miracle of spring. And it's not pink. Which is just about perfect. And, your decorating always inspires me! Inspired by you (and your link to Megan's post) I decorated my mantle for spring this afternoon. Which is nothing short of miraculous since I am the anti-Martha and am clueless about decorating. But I raided hubby's bookshelves for books with pretty cream or green spines, collected bare twigs at the park the other day and repurposed a bunch of earthenware pots as well as pulling out some bird houses my kids painted for a homey touch. Thanks for the ideas. Looks so good! I like pink in my clothes, but not in my decor. I read this post the day you wrote it and I have been thinking of you everywhere that I go shopping! Ha ha! Look at Joanne Fabrics...they had a few cute (non-pink) things. I also went to Kirklands, and although I didn't see it on the shelves, they had a poster up with the cutest (not baby-cute) white bunny figure. I instantly thought of you! We also had a robin make her nest under our deck 2 years ago. It was fun and scary (those mommas are mean!). I felt terrible, because when she tried to make a nest last year, I kept knocking it down to prevent her from nesting there again. I know, I'm mean. No, that's not mean. You're right - those mama robins are quite protective. Because ours was on our neglected deck, we didn't rile her much. If it had been in a high-traffic area, we might have taken a different approach too. Most of the items I've found and loved this year were at Kowalski's! Go figure!